Prayer must be a constant part of Church Life for apart from the Lord we can do nothing of eternal value. As we pray, we tap into His power. Praying matters. 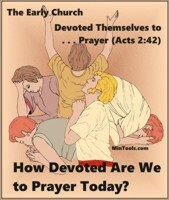 Part of having an effective prayer ministry includes helping others develop a passion for prayer. That must begin with an understanding of what passionate prayer is. We must then take steps to cultivate that passion in others. These tips are included in the Prayer Ministry Manual. Click image to learn more. Teach and preach in a way that people are presented with God as the great God He is, that helps people to understand His ways, and that gives them a good foundation of His Word. In so doing, you will help develop faith, perspective, and discernment that will grow their passion to meet with Him in prayer. A passion for prayer stems out of a passion for God. Keep the purpose of prayer ever before the people. Take great care that prayer doesn’t become routine or ritualistic. Vary the approach. Even Jesus warned against vain repetition (Matt. 6:7). Ephesians 6:18 says we should pray with “all kinds of prayers and requests.” Be careful not to get into a rut. Keep your approach fresh so you don’t become dull or desensitized in praying. Where do people stand in terms of the value and need for prayer? You may need to provide some initial instruction or training about prayer to lay the groundwork if people don’t have that sense. Use Sunday School classes, small groups, and sermons to teach about prayer. Don’t forget about the more informal training that comes from providing an example, testimonies of how God answers prayers, little blurbs in bulletins, newsletter, social media feeds, etc. You might suggest helpful resources about praying like books or articles. — To build a culture of prayer in a church takes a consistent, regular emphasis on prayer as well as actually turning to God in prayer at every turn. If your church already seems to have a culture of prayer, then it may just be a matter of putting a structure in place that works for them. Questions that follow will help you think through a plan tailored to your church. How many people are truly interested in being a part of a prayer team? While you probably desire a big turnout, you may need to start with 2-3 people, while laying the groundwork in others. Rather than let that get you discouraged, remember God’s promise that where two or three are gathered in His name, He is there (Matt. 18:20). The excitement of meeting with God in those who come could be a contagion for others to join. What are the logistics you need to put in place before you begin such a ministry? While it is often good to connect meeting to pray to a time people are already at church, like before or at the end of a service, rather than making them come out special, it does present some challenges. You need to think that through in order to remove obstacles people might have in attending. For example, depending on the time your worship service ends, you may run into the lunch hour. Depending on the people who stay, you may have childcare issues. The more you think through and plan for these obstacles, the better you will be able to meet with people’s excuses. If you don’t work through these issues ahead of time and people come but get discouraged, you may find it harder to get them out in the future. How will you structure the meeting? In some churches a rigid, formal approach may not work. In other churches a more spontaneous approach may not work. Think of the traditions of your church. While you do want to stretch people, taking them beyond where they are in their prayer life, you don’t want to frustrate them or scare them away. Begin where people are and slowly take them beyond. Regardless of the structure, make it worth their while to be there. Make the real focus on meeting with God. What will you pray about? How will you determine what to pray about? Perhaps there are specifics you sense this meeting should focus on, growing out of the needs at your church. If you are going to have a pre-planned agenda, be clear with people about the purpose of the prayer time. If people come thinking you are going to pray for their personal needs and you never get around to it, they may soon stop attending. If you are going to open it for personal requests, guard against spending the majority of time taking requests with little time left for praying. Think through these questions with your church in mind. While you can learn from what others do, begin with where your people are and go from there. Prayer a Lifestyle? Praying Part of Your Church Culture? To pray without ceasing (1 Thess. 5:17) is to make prayer a lifestyle or permanent practice in your life, a part of your church culture. 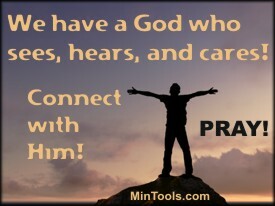 To pray without ceasing is to pray at all times and for all things. Setting aside times devoted to concentrated, undistracted prayer in our individual lives and as a church is very important. But, we also need to go through our daily lives attentive to God, consistently asking God His opinion and desires and always giving Him thanks. To pray without ceasing is what has been called “practicing the presence of God” — always conscious of His presence, turning to Him as a constant companion, making no topic off limits with Him. Keep in mind that we do not need to pray for His presence in our lives. We have His promise that He is already there. In calling people to prayer, we need to be careful that we are not making prayer come across as a passing fad or following the latest church movement. Prayer needs to be seen as the norm, as the expected response in any and all situations. When prayer is a pattern, we do not just come together for prayer in times of need or crisis. As seen in the example of the early church (Acts 2:42), we will be devoted to prayer wherein we promote a prayer environment and not merely a prayer meeting. In conversations, ask the person if you can pray with them right then about what was just shared. Soon you may see other pockets of prayer around the church as people follow your example. When someone e-mails you with a prayer request, let them know that you will be praying for them as you send back your reply. You may even type out your prayer or part of it in the e-mail. As you hear or watch the news, silently pray for the current events right then and there or ask those in the room to join with you in prayer. In your sermons or teaching, refer to times when God led you to stop and pray as illustrations when appropriate. People may grab hold of that idea for their own lives. In addition to this content, the Prayer Ministry Manual looks at what happens when prayer is more a matter of lifestyle, or a pattern, than a sporadic effort. You will also find an assessment using an acrostic of the word “devoted” as we need to be devoted to prayer if it is going to become a permanent practice. Praying on God’s Terms, According to Biblical Principles? Prayer was instituted by God as the means of communing with Him. He is the One who determined that prayer would be the way humans would work in cooperation with Him. Prayer is His idea, not ours. Consequently, it is only logical that we come to God on His terms, not ours. God will never contradict Himself in the way He answers prayer. God is not obligated to respond to prayer that violates His character or Word. Consequently, the more we come to truly know God in the full essence of His being as depicted in Scripture, the more we will pray in ways that tap into His power. When you teach on prayer, go beyond the mere commands and principles about praying to the basis for that command or principle in the character of God. In addition to this content, the Prayer Ministry Manual considers how the fear of the Lord prevents us from living in violation of God’s character and Word and from expecting God to respond to our prayers in ways that contradicts Himself. 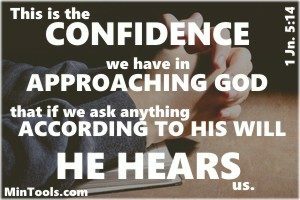 You will also find a personal assessment for how well you adhere to God’s conditions for praying. If you want to develop a prayer ministry, personally or with a group, one of the first questions you must ask is “Why?” — What are you hoping to accomplish through it? Maybe you are hoping to see God take care of a list of requests. You possibly want to see Him do great and mighty things in your midst or to bring revival. Perhaps you simply want to be obedient to His command to pray. Or, you may be trying to emulate the early church of the New Testament of whom it was said that they devoted themselves to prayer (Acts 2:42). While all that and much more can happen as people meet together to pray, you will undoubtedly find a greater level of effectiveness when your purposes are centered more on God than on you. When prayer is about Him and not you, you tend to come to Him with the right heart attitudes. Your role, though important, isn’t primary. If you want people to be devoted to prayer, like the Early Church, you must be focused on the right purposes for having a prayer ministry. Use prayer as a means of keeping focused on God. Use prayer as a means of acknowledging His grace in your life. Use prayer as a means of keeping His sovereignty in place in your life. Use prayer as a means of maintaining your relationship with Him. Check out the Prayer Ministry Manual where you’ll find some thoughts on the above four points as to what heart attitude we need within each of these purposes and the role we have in it. You will also find a parallel of the above points to Jesus’ sample prayer in Matthew 6 (commonly known as The Lord’s Prayer). And, you will be guided in determining if you, as an individual, or as a prayer group, have the right purposes for praying. To have an effective prayer ministry, whether that be personal or corporate, we must begin on the basis of a personal relationship with God. Praying is rather meaningless and empty if we don’t sense that Someone is seeing, hearing, and caring. We must understand and value the relational aspect for prayer ministry to be effective. Remember in Luke 11:1-4 when one of the disciples asked Jesus to teach them to pray, He said to them, “When you pray, say: ‘Our Father …’.” Jesus was teaching the personal and intimate nature of prayer. — It is connecting with our heavenly Father. — It is coming into the presence of the Almighty God. — It is communicating with a living and personal God. Make your prayer meetings or prayer efforts about relationship, not merely praying requests. Words are shallow and meaningless when there is no sense of connection. You’ll find that when God Himself is the main attraction, you won’t need gimmicks or arm-twisting to keep people coming. Order the Prayer Ministry Manual for a study on each of the above points involved in the relational aspect of prayer — connecting, coming into His presence, and communicating.